A Louisiana man's decision to jump on an 11-foot alligator left him with a gash on his hand that required 80 stitches. "I've always been the kind of guy who learns the hard way," said Glen Bonin in an interview with KPLC-TV in Lake Charles, La. 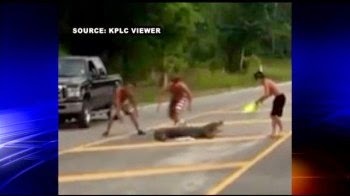 Bonin and three of his friends tried to move the gator off a road in Sulphur, La., KPLC reports. The encounter was captured on video. "(We) took our shirts off, threw it on (the gator's) face, and we were going to come from behind it and jump on it . In the process of doing that, it spun around and grabbed my hand seconds before we jumped on it," Bonin said in the interview. Bonin told KPLC it felt like someone was pulling his arm out. "I thought I was about to lose something," he said. Bonin advised others against doing what he did. "Call wildlife and fisheries, call the sheriff, call somebody, stay in your vehicles don't try to play with them or move them," he said in the interview with KPLC. "Leave it to the professionals, that's what they say."